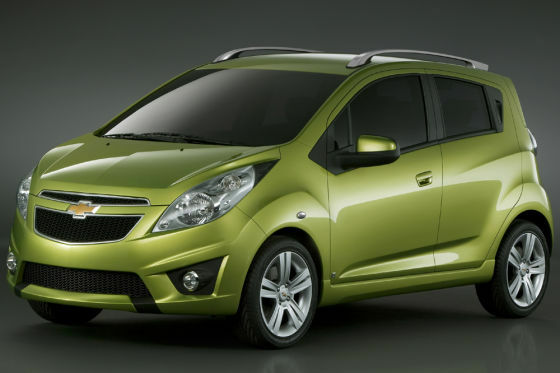 Somebody in Carspyshots has posted a picture of what he supposes is the production version of the Chevrolet Beat. IAB has posted spy shots of Chevrolet Beat in the past, and the most recent one was from Rochester University in New York. We also informed you about the Beat's postponement in India, which will make it's first appearance during the Detroit Auto Show which is to commence soon. On inspecting the picture, I'm startled to see how much of a resemblance it holds with the concept car. The concept car was also colored using the same shade, insisting GM didn't want to keep them very far apart to it's first time viewers. The headlamps, bumpers, windows and even the peeping tail lights are terribly similar. The design of the Beat is futuristic, but practicality has not taken a hike in the midst. You can observe roof rails, big mirrors and a high ground clearance- A comprehensible indication that it is going to be sold in markets such as India, where these things are a necessity. Ingress and egress must not take a lot of effort, thanks to the sizable doors. Besides, the hood line is higher, in order to meet pedestrian safety norms in Europe. The Chevrolet Beat concept vehicle is years old, and it was designed with inputs from none other than our own Dilip Chabbria. The Chevrolet Beat will be positioned above the Chevrolet Spark and will go head to head with cars like the A-Star and i10. The Chevrolet Beat might also turn out to be India's first hatchback with a turbocharged petrol engine. IAB Comment- If such a car is brought to India, you and I know the response it will evoke. Frankly speaking, It makes the Hyundai i10 and the Suzuki A-Star look like old hats. Cars like the Chevrolet Beat have a big market in India. We say this is going to be the poor man's Civic.